Did you know it's Nutty Fudge Day today? According to the Days of the Year website - it's actually a thing that is celebrated! Crazy right? There are many more days like this out there around the world. They may sound ridiculous and a tad weird but people take them very seriously and happily celebrate these days. Each to their own - I'm not going to judge. It does make me giggle though, because there are some hilarious holidays/events that are actually celebrated! 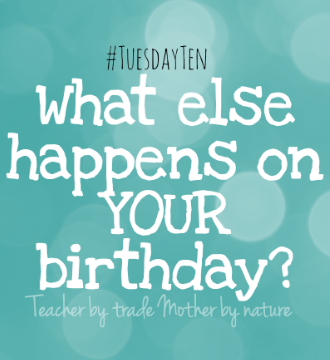 Check out what holidays other bloggers won't celebrate - just click the #TuesdayTen button found at the bottom of this post. Have you ever been to the supermarket or walking down the street and you bump into someone you know...however, you can't remember their name? Ooh I have and it really bugs me. I usually leave that person still not knowing their name until it hits me at the most random time! I am pretty good at remembering faces and names though - it must be because I'm a teacher, and have to remember my students names. It's not what you think...it's not a day where you get to hang out with your mates...Hanging Out Day is when you hang your washing/laundry on the line, using the natural energy of the sun and wind to dry your clothes. Yum! I love Rice Pudding - must remember to celebrate this day. Also celebrated on this day...Curious Events Day, World Post Day, Moldy Cheese Day, and Fire Prevention Day. Also celebrated on this day...Small Business Saturday. Share the love and shop with Small Businesses for one day - my birthday! How cool is that! I like this a lot! Is there an event, festival, funny, weird and/or wonderful holiday that falls on your birthday? Click here to find out and let me know in the comments below. On my birthday, it's Open An Umbrella In the House Day, among others. I had such fun reading the celebratory events of the year. I'm saying French toast would be a great birthday breakfast. I get Coconut Tortes on my birthday. Oooh nice Val! Coconut Tortes sound like a treat! 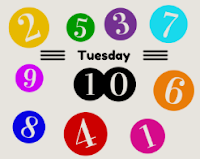 I enjoyed putting this list together - so many weird and wacky days that are celebrated. I love the way you did this! I think it's funny that whiskey sour day and kiss and make up day are the same day. Maybe if you drink less, you won't have so much to apologize for!! LOL! OMG! I love what you did with this!!!!! My birthday is March 1st which is also Horse Protection Day, Plan a Solo Vacation Day (Yeah! ), Namesake Day, World Compliment Day (I'll take that on my birthday! ), Fruit Compote Day, and Pig Day (Um?????). Wow! That's a lot of special celebrations! We actually did a book list post back in February which was Library Lovers Month, but we will have to make note of Book Lovers Day for sure! Thanks Lisa. I remember your Library Lovers Month post - and how much you and Rabia love books. I think I shared Top 10 Children's Books that week...it was fun! What happens on Pig Day? LOL. What fun~! Mine is April 8th...Visit a Zoo Day and Draw a Picture of a Bird Day. Who knew? I am driving through on the A to z Road Trip. Starred you so I can find out more! Oh my we should have shared a birthday - I Love French toast!!!! Apparently April 22nd is Jelly Bean Day!!!! Whooooop!!!! great read - had to laugh at "brother #2"'s one - blame someone else day - its such a sibling day!